We are 4 students and we decided to realise a blog about the Amazon rainforest. We are studing in a engineer school of international agro-developpment in Paris. Our names are Clemence, Amandine, Victoire and Florence. We are 20 years old. We create this blog as part of our english class. We have chosen this topic because we would like to travel in this area and we feel concerned with ecological disaster in this part of the world. Moreover we think it's important to be informed and to have a critical point of view about what it is said by public opinion. This blog is made to have talks and to share your feeling about Amazon deforestation. Countries: Brazil (60%), Peru, Venezuela, French Guyana, Surinam, Bolivia, Colombia. 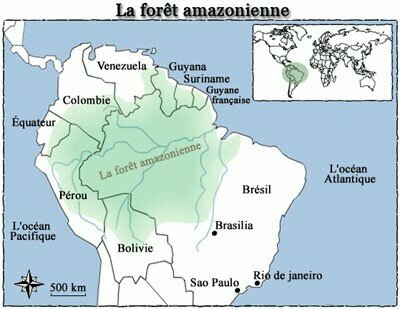 Amazon is composed of three woods which are the wood of " Terra Firme", the wood of "Varzea" and the wood of "Igapo". The wood of "Terra Firme" is made of formidable trees, it's the biggest and it's is rich of "hard" species. The wood of "Varsea" was the first wood to be utilized. It is rich of "white" species as palm-trees. The last called wood of "Igapo" is a boggy land practically not exploited. Each year Amazon looses about 4,3 billion hectares which represents one football's terrain each 5 seconds. 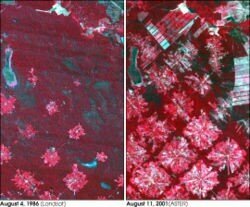 Satellite's images of deforestation in Bolivia between 1986 and 2001. In Peru the president is Alan Garcia. Recently he has questioned the existence of uncontacted Indians living in the Amazon rainforest. The president’s comments come just six weeks after 21 uncontacted Indians were photographed in south-east Peru. In an article appears in El Comercio (one of Peru’s major national newspapers), he affirmed:”We have to exploit massively natural resources of the country and the Amazon is the number one!”; although he acknowledged that his point of view is not shared by all. Furthermore, Brasil is about to sanction the trade coming from illegal deforestation. Indeed, amazonian land owners are allowed to feel trees in 20% of their area, but the main part cut much more than that. Today, it is known that more than 17% of the amazonian natural vegetation has been destroyed. In most of the case, to create new pastureland. -Pinus patula in the mexican Andes. -Eucalyptus in the whole Latin America. But, if those actions came from the reforestation, it is prooved that those species impoverish a lot the soil. More than that, if we would like to balance the CO2 mondial emissions, it would be necessary to invest almost a quarter of the lands used for agriculture! Do the developping countries must solved the errors of the industrialized countries? We choose to put those links not in the area specially designed for because plenty of informatons that could, and we hope that they will raise question. We are waiting for your commentaries!!! 75 millions (surface) of wood exploited each year nd the governement gives just 25 millions of licences!!! 70% ::::> in the Amazon river, the rate of mercury is 70% higher than the international standard. 80% of ilegal exploitation (wood) in Brazil. 2/3 it was in 1999 the rate of intact forest. 2020 it is the year of the previsionnal desapparition of Amazon. Will Amazon rainforest survive to the deforestation? Are the damage due to human activities reversible? What are the governemental, agricultural and associative initiatives?